“That’s how I look at it,” says the 15-year veteran from Kenwood Academy who’ll turn 36 next month. “That the Bulls have one of the best backup centers in the league. I think I’ve proven when given the opportunity, when called upon, that I did a solid job. But first Mohammed is about to make a lot of Chicago kids happy, among others. Mohammed in his return to his native city last season to play for the Bulls held a charitable event to raise funds for capital improvements at his old high school, Kenwood. 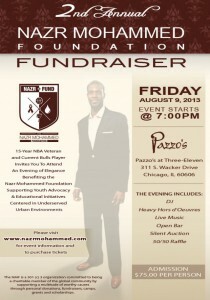 The 2nd Annual Nazr Mohammed Foundation Fundraiser will be held this Friday, Aug. 9, at Pazzo’s (311 S. Wacker, Chicago, IL). 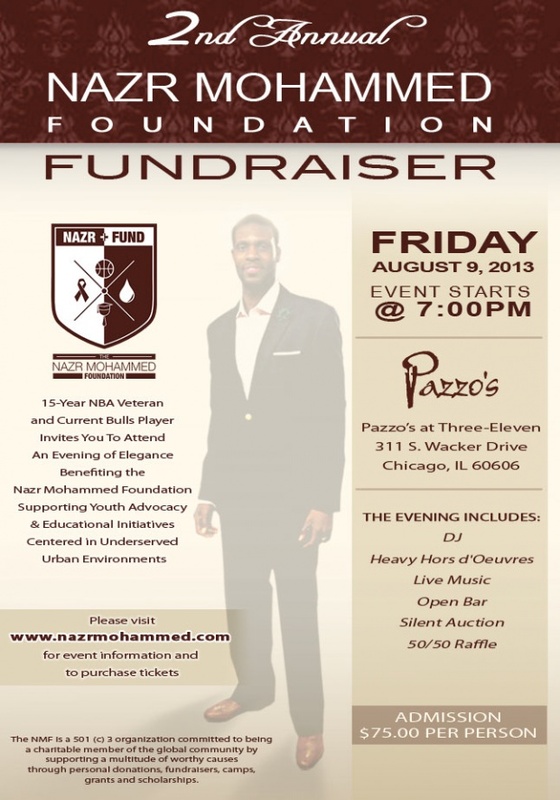 That fundraiser was such a success that Mohammed is conducting his second annual this Friday, again at Pazzo’s, 311 S. Wacker, starting at 7 p.m. Tickets are $75 at NazrMohammed.com and $100 at the door. Among the events will be auctions of celebrity memorabilia, including an authenticated signed Michael Jordan jersey from the 1997-98 championship season. There’ll be a raffle with proceeds going again to Kenwood. But Mohammed is expanding the event to raise funds for three charities/civic organizations his NazrMohammed foundation will be supporting. In addition, he’ll be raising funds for a new program of his called The Village Project to hold a retreat for 100 Chicago high school students aged 14 through 18 to further positive role models in the community. Just like Mohammed, the once portly high school kid and questionable prospect who played for collegiate and NBA championship teams. In returning to and embracing Chicago again playing for the Bulls last season, Mohammed also decided to reach out to help support groups doing good work. He said he will announce the names of those groups his foundation will support Friday during the fundraising event. Mohammed said he worked with the Bulls to examine and accept various groups and agencies and is excited to be helping the community. And Mohammed ended up helping the Bulls last season perhaps even more than expected, and he should be part of the regular rotation this season. Although there’s been talk the team wants to add another big man, Mohammed proved valuable late in the season when Joakim Noah missed 12 games with plantar fasciitis. Mohammed also had big roles in key Bulls playoff wins in the Brooklyn series, if perhaps his most notorious moment in the Miami series when he got into a fuss with LeBron James in Game 3 and James tumbled over backward after being pushed by Mohammed. Mohammed expressed regret for losing his temper and being ejected early in the game when he felt he could have been more help. He said he was sorry as that was not the role model he wanted to be for his children. But Mohammed admits he hears more about that incident than much of anything even about his long career. Mohammed, though friendly and approachable, is serious minded and a tough self critic. When asked about highlights to the past season, Mohammed says initially just being able to help the team. When pressed, Mohammed did volunteer that, yes, that Game 4 against Brooklyn was enjoyable. That was when after Nate Robinson’s fabulous finish to get the game to overtime, in the third overtime it was Mohammed after sitting the fourth quarter and overtimes making the big basket and retrieving a Carlos Boozer missed free throw to clinch and save the game. Mohammed rarely played the first three months of last season as he adjusted to the Bulls and Thibodeau adjusted to him. But Mohammed always has been known as a good teammate and strong figure within his teams. So he waited patiently, and then when called upon he produced. He averaged 2.6 points and 3.1 rebounds last season. But 7.3 points and 7.8 rebounds in 12 starts and 6.9 points and 7.4 rebounds in April when he substituted for the injured Noah and Taj Gibson. 1. April 27. Playoff Game 4 against Brooklyn: Mohammed has nine points and six rebounds in 19 minutes, including the score and rebound that effectively sealed the Bulls amazing 142-134 triple overtime win. 2. April 22. Playoff Game 2 against the Nets: With Joakim Noah starting slowly after a poor Game 1 when the Nets blew out the Bulls, Mohammed had an early three-point play and back to back baskets to help the Bulls to an early lead. He finished with eight points in 18 minutes, and then Noah was able to finish with a strong fourth quarter to save a 90-82 win and put the Bulls back in the series. Thibodeau stayed with Mohammed for size after going small in Game 1 and it helped shut off the Nets’ inside game. 3. April 4 in a 92-90 victory in Brooklyn: With Noah out, Mohammed had four points and nine rebounds. But he saved the game down the stretch, forcing Brook Lopez into a turnover with 33 seconds left and then blocking an attempted Lopez winner with 6.6 seconds remaining. 4. March 23 in 87-84 win over the Pacers, the Bulls only win over Indiana during the season: Mohammed held down Roy Hibbert and with Noah out had 11 points, seven rebounds with five offensive and three assists in 31 minutes. 5. March 24 in a 104-97 win in Minnesota: Starting in his second of a back to back set, Mohammed grabs a then season high 10 rebounds in just 22 minutes in the Bulls win, showing the stamina that belied his 14 years in the NBA. 6. April 12 in a 97-88 loss in Toronto: With Noah and Gibson out injured and Carlos Boozer fouling out, Mohammed plays 43 minutes and gets 16 points and 13 rebounds going 43 minutes. 7. April 17 in a 95-92 win over Washington: In the final game of the regular season with Noah and Gibson merely testing themselves and their injuries, Mohammed leads the team to a win with 17 points and seven rebounds in 22 minutes. 8. April 2 in a 90-86 loss in Washington: With Noah, Marco Belinelli and Richard Hamilton out, Gibson getting hurt and Kirk Hinrich ejected, Mohammed has 12 points and 12 rebounds in 36 minutes and a late tip-in that could have given the Bulls the lead waved off in a controversial finish like Noah’s waved off tip-in against Denver. 9. The flop! 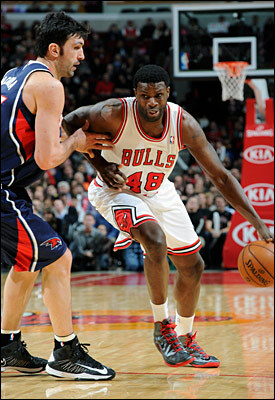 Sorry, Nazr. May 10 as Miami pulls away in the fourth quarter for a 104-94 win to give them a 2-1 lead in the conference semifinals. In what became an ugly series after the Bulls won Game 1 and Miami retaliated physically in Game 2, Mohammed got into an altercation with LeBron James in the second quarter with the Bulls leading. Mohammed reacted with a push back at James, who pitched backward as if shot in what Thibodeau called a flop. It would become a stand up moment for a somewhat embarrassed Mohammed. And increasingly famous as this YouTube video suggests.